Most women have toned legs and a strong core at the top of their "goals" list, but too often, they tend to be lax about training their upper bodies. Why? Well, it's partly due to the fact that women are often afraid of building bulk in their arms and shoulders. But the thing is, having a strong upper body is essential for everything from lugging around kids and groceries to maintaining good posture. Plus, it may be cold outside now, but tank top season will be back before you know it! This workout can help you build strength (without bulk) so you can achieve both goals: feeling great and looking good. And if you often get frustrated with your "weakling" arms, have no fear, I've chosen each of these moves for their ability to build strength, no matter where you're at currently. 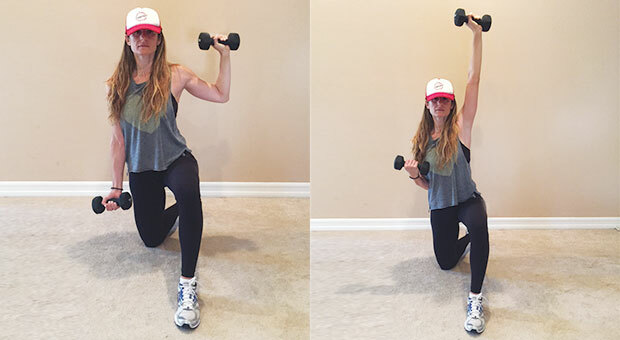 Anyone can do them; Just start out using lighter weights (3 to 5 pounds) and as you get stronger, you can move on to heavier dumbbells. 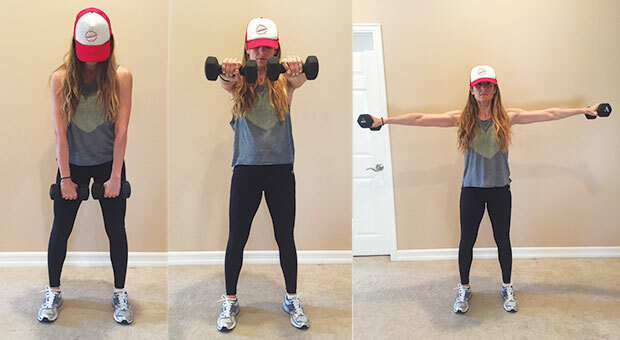 Start by holding two dumbbells in front of your body with your palms facing inwards. From here raise both arms just above shoulder height, rotating your palms to face outward. Your arms should form an X. 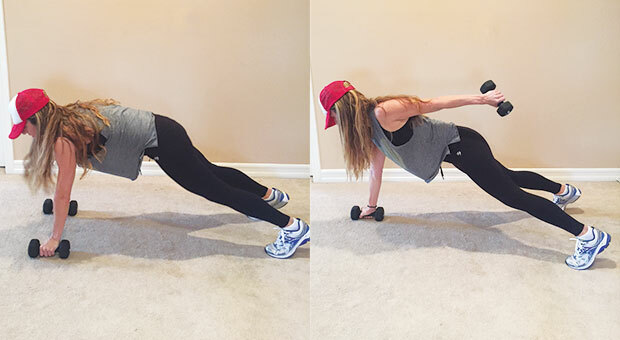 Lower back down and repeat for 12-15 reps.
Get into a plank position, holding two sturdy dumbbells. From here, perform a push up. When you get back to the top, perform a row with your left arm. Release back down and perform a row with your right arm. A little too much? You can also do this from your knees or without dumbbells. 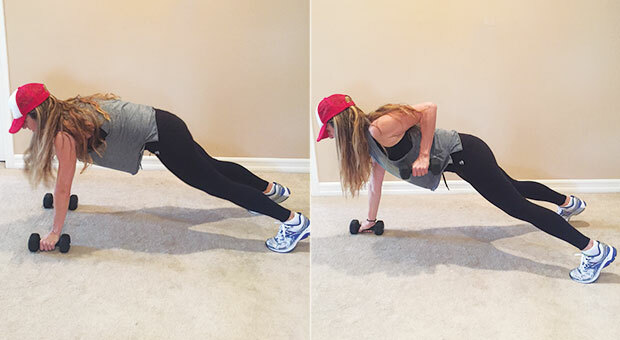 Perform 6-8 reps.
Get into a plank position, holding two sturdy dumbbells. From here, lift your left arm up and extend it backwards alongside your body. Be sure to keep your elbow close to your body throughout the entire movement. Repeat on the right side. For beginner's, you can perform this move from your knees to start with. Kneeling on your right knee and holding two dumbbells at your sides, raise your left arm up laterally to shoulder height. Your palm should be facing the floor with your arm straight, but not locked out. With your right arm in a 90 degree position, perform a shoulder press. Repeat for 10-12 reps before switching sides. Kneeling on your right knee and holding two dumbbells at your sides, perform a bicep curl with your right arm and a shoulder press with your left arm by pressing your arm straight overhead. Repeat for 12-15 reps before switching sides. 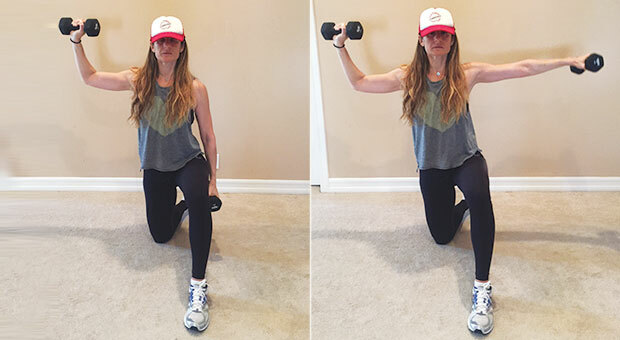 Stand with your feet shoulder width apart, holding two dumbbells at your sides. From here, start raising your arms in front of you, keeping your arms straight and your palms facing the floor. When your arms are at shoulder height, pull them towards the side of your body until the are straight out to either side of you. 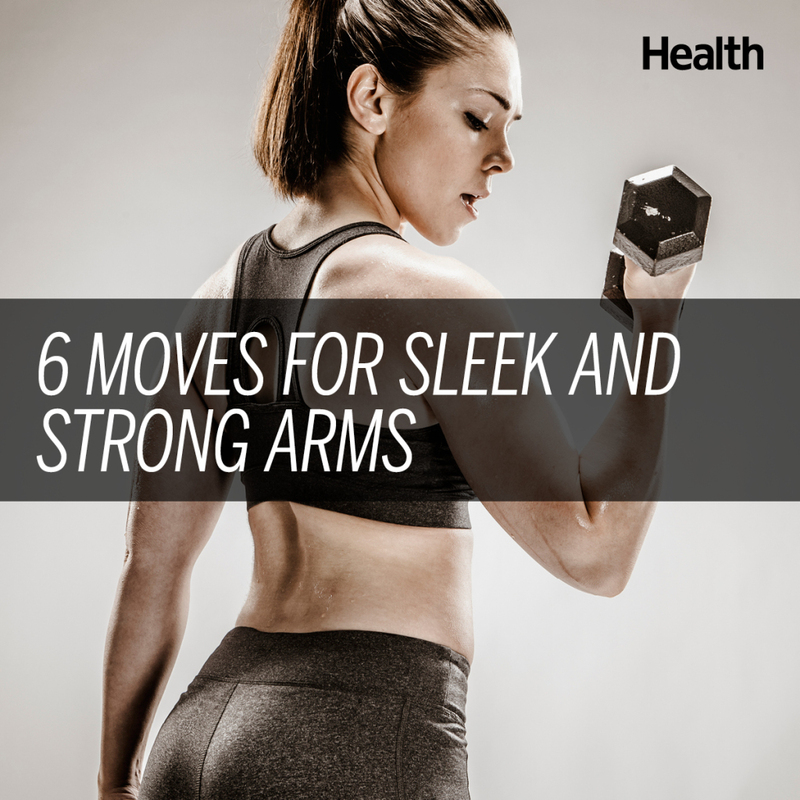 Make sure your arms stay straight throughout the entire movement. Repeat for 6-8 reps. Looking for more ways to ring in your New Year with a bang? Try these 4 Ab Exercises You've Never Seen Before. Jennifer Cohen is a leading fitness authority, TV personality, entrepreneur, and best-selling author of the new book, Strong is the New Skinny. With her signature, straight-talking approach to wellness, Jennifer was the featured trainer on The CW’s Shedding for the Wedding, mentoring the contestants to lose hundreds of pounds before their big day, and she appears regularly on NBC’s Today Show, Extra, The Doctors, and Good Morning America. Connect with Jennifer on Facebook, Twitter, G+ and on Pinterest.